Ever been to a party that’s so boring you wind up praying for someone to spice up the festivities by throwing a cake at a ceiling fan or something? That’s essentially what Pauly D did during last week’s episode of Jersey Shore Family Reunion when he secured his title as prank war CHAMPION by inviting Angelina Pivarnick to the South Beach house. Look, it’s been fun to catch up with our favorite gang of guidos and cringe as they continue to fist-pump in various VIP sections, despite the fact that half of them are parents and the big 4-0 is fast approaching. But let’s be honest — this isn’t the drama-packed Shore of yore. Pauly euphemistically described the situation as a bit “too kumbaya” but some fans have been less generous in their assessment, calling the relatively conflict-free proceedings flat-out boring. Which leads us to believe the decision to re-introduce Angelina had less to do with Pauly’s prank war title than with the producers’ realization that a rental house populated with middle-aged vacationers isn’t always the stuff of scintillating television. At first, things worked out as planned. The girls arrived home drunk, and they were not happy to see the Rob Kardashian of Staten island chillin’ at their dining room table. Initially, it looked as though we might be treated to a reenactment of the famous Snooki vs. Angelina fight that took place the last time the gang visited Miami. Snooki was pissed about Angelina calling her ugly in an interview; Jenni felt that Pivarnick had no right to be there; Deena … well, Deena sort of just flitted around spouting catchphrases and getting emotional, as she’s been doing all season. Angelina went out day-drinking with Snooki, Deena, and Ronnie — and she actually managed to win them over. By the end of the bender, she’d even been dubbed an official meatball, though to be fair, by that time Snooki was so hammered she would have befriended an actual meatball. So much for that conflict we’ve been waiting for all season! There was even an act of selflessness, as Angelina attempted to make Deena feel better about being pushed in the pool by allowing herself to get dunked in the drink. Unfortunately, Pivarnick’s efforts were largely for naught, as the rest of the cast quite understandably doesn’t want her hanging out and reaping the benefits of the “family” (read: media empire) that they worked so hard to create. As you’ve probably noticed by now, this season has stuck to a very specific episode structure, with each installment ending on a cliffhanger. 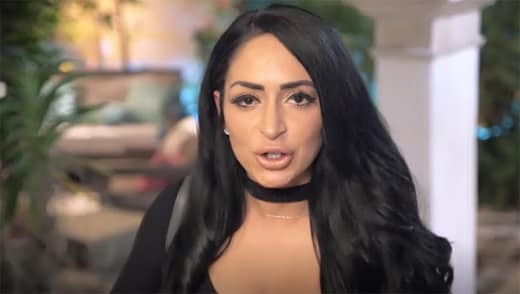 So we’ll have to wait until next week to find out how Angelina will cope with getting booted out of the house by JWoww. Being that a scant eight days ago we were only vaguely aware that Pivarnick was still alive, we can’t help but feel that suspense is a bit unearned. Watch Jersey Shore online to remind yourself of a bygone era in which guidos settled their differences with fisticuffs, not passive-aggressive dinner parties. Previous story Josiah Duggar: Bachelor Party Details Leave Fans STUNNED!